Actor and social media sensation Mawra Hocane has proven that she is more than a pretty face. While we are well-acquainted with her acting and performing talents, the young lady has proven that she has a strong intellectual side as well. 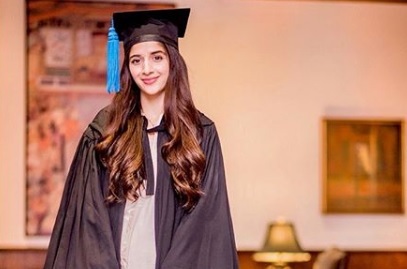 Mawra on Thursday celebrated her law graduation, a few months after she cleared her law exams with flying colours, scoring the highest in Islamic Law and earning a distinction. “LLB High achiever award! Allah is the most kind, absolutely grateful for my parents and extraordinary faculty and for all the prayers from all of you!” she captioned the pictures. Mawra had appeared for the exams in May and had posted photos of herself prepping for them amidst her hectic shoots. Diva X Law student. God save me 🙈🙈 #JPNA2 dooobai schedule! @shabandavid @nabila_salon #lawstudent #JawaniPhirNahiAni2 #mawrahocane PC: @hchoudaryy always.. The actor is currently riding high on the success of her latest release Jawani Phir Nai Aani 2. She will be seen next in Hum TV’s much-awaited drama serial Aangan.